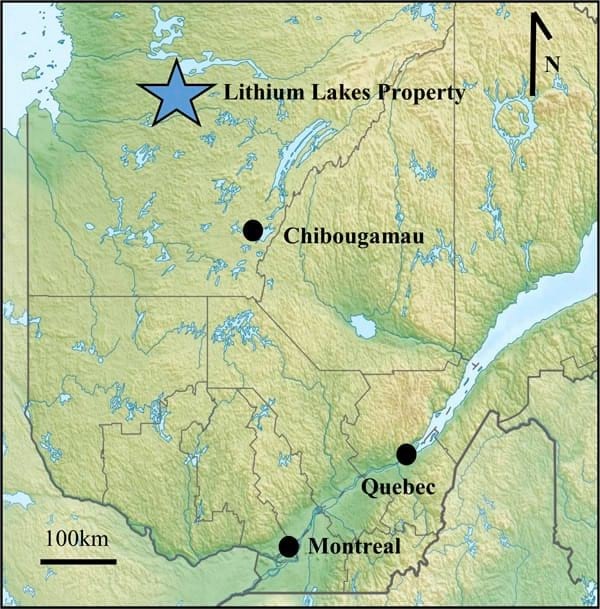 The Lithium Lakes Property (the "Property") is located about 10 km north of the "Route du Nord" and between 8 and 30 km from Nemaska Lithium's Whabouchi Mine. The road originates from the town of Chibougamau, approximately 250 km to the SSE, and connects the village of Nemiscau and the Route de la Baie-James. 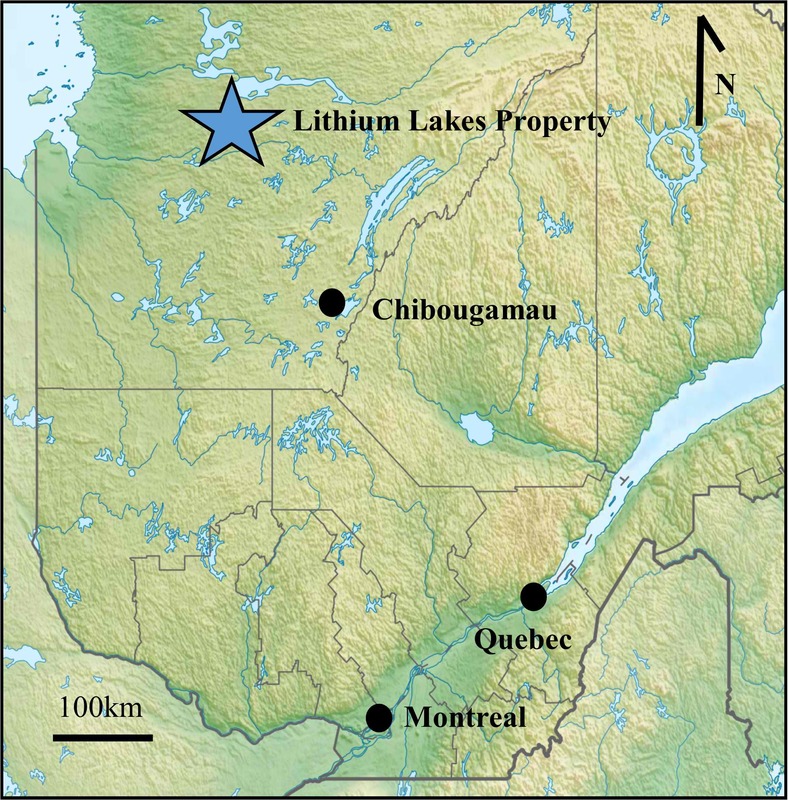 The Lithium Lakes main claim block extends 15 km in a NE-SW direction and 6 km in a NW-SE direction. A network of Hydro-Québec access roads crosses the eastern part of the Property. Several prospective areas may require the construction of ATV trails for local ground access. The Lithium Lakes Property is comprised of 4 blocks of claims, totalling 105 active claims located on public land (Figure 2). The Property has a total area of 5,596.5 ha or 55.965 km2. 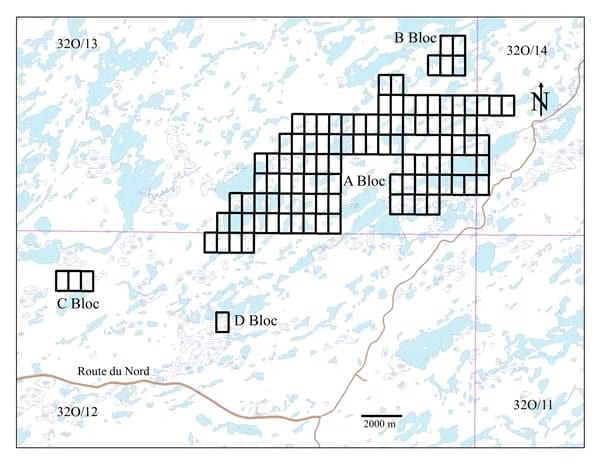 The Property geology is similar to the Whabouchi Deposit, owned by Nemaska Lithium, which is located a few kilometres to the south-west (Table 1 and Figure 3). The main basement rocks are Archean gneiss, overlain by a volcano-sedimentary belt, metamorphosed into biotite-silimanite schists to the south and adjacent to a granodioritic porphyry to the north. Fragmented horizons of amphibolitized ultramafic and Archean granitic intrusions are also part of the Property. Pegmatite sills and dykes are thought to originate from the granitic intrusions. 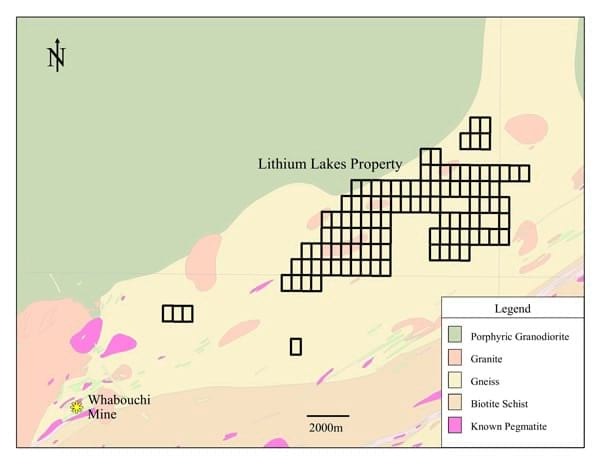 Most of the historical work in the area surrounding the Wabouchi deposit was performed beyond the boundaries of the Lithium Lakes Property, in the greenstone belt located south of the Property. The Property was subject to historical electromagnetic, magnetic, and spectrometric surveys, along with a geological reconnaissance survey and lake sediment elemental analysis. The five different historical surveys were used to generate high probability targets for lithium exploration. 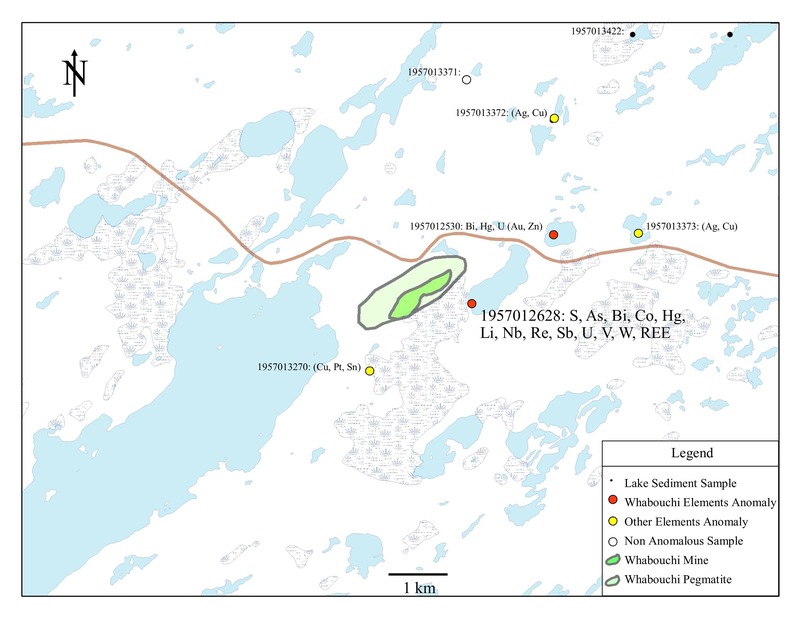 The specific parameters observed at Nemaska Lithium’s Whabouchi Deposit are similar to the geophysical and geochemical anomalies observed at various locations on the Lithium Lakes Property. 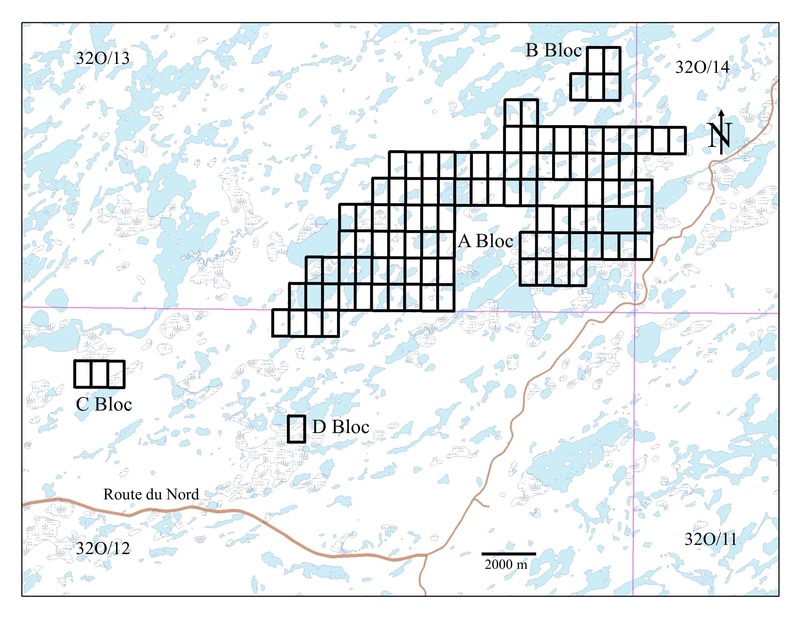 The 2008 magnetic survey was examined to find areas of low magnetic intensity, which could correspond to the location of granite and pegmatite due to their expected contrast with the surrounding paragneiss. Topographic highs are also indicators of rock units resistant to erosion, such as pegmatite and granite. Areas with low magnetism associated with an elevated topography were considered significant targets and 22 such anomalies were defined. 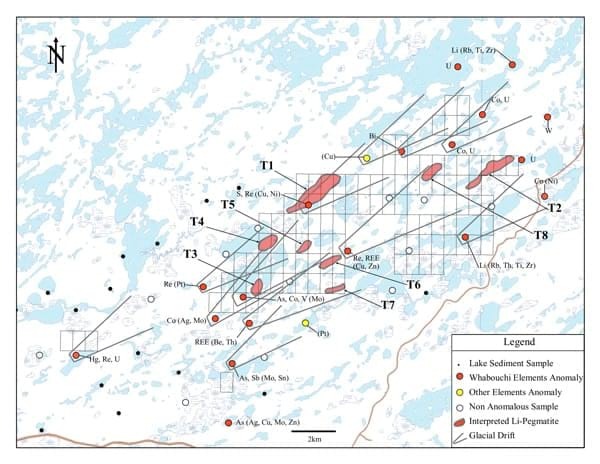 The 2009 spectrometric survey was then analysed to find areas of high emission, which could indicate the presence of minerals that may be associated with pegmatite complexes and potential lithium mineralization. The high spectrometry emission areas that correlate well with the magnetic survey results indicate that there are 8 anomalies that meet the combined high topographic, low magnetic and high spectrometric criteria, and could potentially be mineralized pegmatites. Interpretation of the regional lake bottom sediment analysis data enabled the definition of exploration targets on the Property. The elements identified in the lake sediment assays were considered anomalous when they exceeded twice the background value of the sediment population. The population was determined by selecting the lake sediment assays located in the gneiss geological formation. The background was calculated using the mean value for each element in that population. The source of the lake sediment anomalies could be mineralization proximal to the lakes, or could also be derived from transported glacial till. Most of the material in the lake sediments is derived from glacial till. Exploration targets were considered high priority if lake sediment anomalies were found down ice to the targets generated by the topographic, magnetic, and spectrometric analysis. All 8 of the high-priority targets defined following spectrometric analysis are associated with lake sediment anomalies, while 9 additional lake sediment anomalies are related to the targets defined by the magnetic survey alone. The combination of topographic, magnetic, spectrometric and lake sediment analysis allowed the definition of 8 anomalous areas which are highly prospective for lithium mineralization hosted in pegmatite bodies. Figure 4 shows the Whabouchi anomalous signal. Figure 5 shows the location of the 8 highly prospective targets on the Lithium Lakes Property. Table 2 provides a summary of the data leading to the selection of the high priority Lithium Lakes Property targets. Table 3 provides a comparison of observed parameters seen at the Lithium Lakes targets and the Whabouchi Deposit. Readers should be cautioned that the mineralization hosted on Nemaska Lithium’s Whabouchi Project is not necessarily indicative of the mineralization hosted on the Company’s Lithium Lakes Property. Dr. Remi Charbonneau, Ph.D., P. Geo #290 (an Associate of Inlandsis Consultants s.e.n.c.) is an Independent Qualified Person under National Instrument 43-101, and has reviewed and approved the technical information provided here.